After dealing with pesky back-to-back viruses that both involved low-grade fever and high-grade fatigue, among other things, I made it back to the garage on Sunday. By then I’d gone to Body Combat twice since recovering, though. 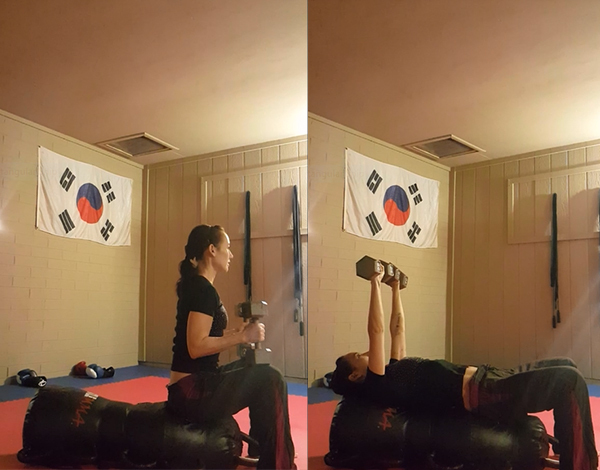 I was determined to make my first garage workout in two weeks a strength-training workout, because that was the whole point of this series of garage gym workout posts: To hold myself accountable for my New Year’s resolution of incorporating strength-training into my weekly conditioning routine. 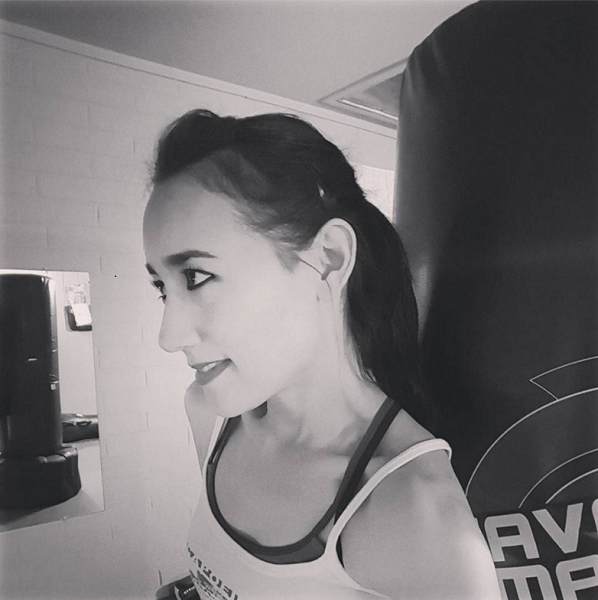 So far, I’ve only done martial arts and general conditioning posts. I like doing a variety of workouts, but let’s face it… it’s time to get down to business here! 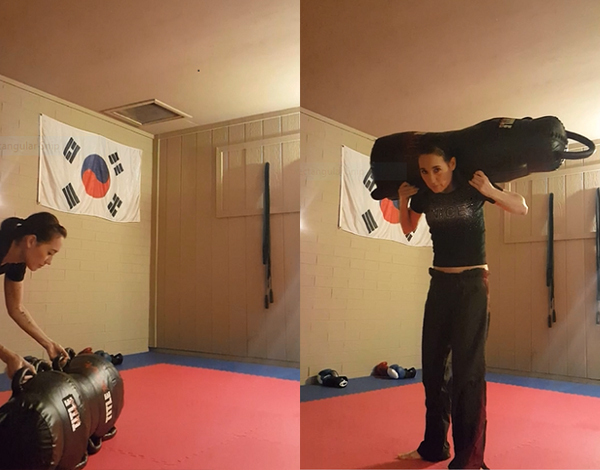 I went in thinking I’d do a dumbbell workout, but I ended up mostly using our MMA dummy. I saw it lying there and thought, why not? The MMA dummy has many uses. Today, it’s my main strength-training weight. Do not think for a minute that I picked this thing up and threw it onto my shoulders. Unfortunately, I can’t entertain you with the maneuverings and contortions involved in hoisting it up there. As usual, I snipped these pics from video footage. The way it works is I set up my camera (phone) in its designated place so the view of the room is the same every time I record. There was no way the MMA dummy operation was going to happen in view of the camera. The dummy weighs 50 lbs (nearly half of my weight), and it’s ungainly. I needed to find something that could assist me, and whatever it was, it wasn’t going to be in the middle of the mat. We’re careful to avoid even wearing shoes on the mat! Looking around the garage, I spotted the chair near the back door. The chair has arms. I could place the dummy across the arms and then slip my head under it, the way you do with a bar on a rack at the gym! Problem solved. It didn’t work as easily as I thought it would. The chair has wheels, so after a few comically failed attempts, I pushed it back against the wall to stabilize it. Then I had to half-squat, half-bend down at an angle to get my head under the dummy. The dummy is wider than the chair is deep, which might be hard to visualize, but you can visualize me crouched over the chair, face-down, like I’m hanging over a toilet throwing up, except on my feet in a deep, twisted squat rather than on my knees, and the top of my head pinned to the back of the toilet and a young St. Bernard sitting on my neck. Maneuverings and contortions, I’m telling you. It occurred to me to change the position of my feet and pull one end of the dummy down slightly, so it would rest diagonally across the chair’s arms. I held it in place against the back of the chair with my left hand while pulling it down past my neck with my right hand, relaxing my left hand the further I got the dummy down on the right. When I’d inched it down far enough, I carefully backed away from the chair while lowering my body even more, dropping my head, and sliding my hands under and up between my shoulders and the back of the chair and reaching higher to grab the handles behind my head and adjust my stance so my feet would stay rooted under the weight. 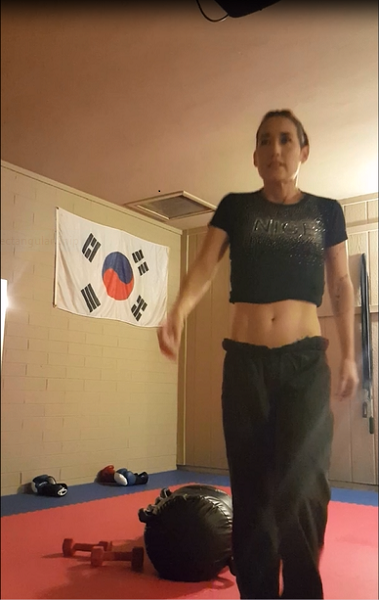 Using my knees, I rose up to standing position. The dummy was on my rear delts/upper back, where I wanted it to be. It took at least 10 minutes to get it there, but once it was there, it was fine. By the way, the handles all over this dummy are genius! Squats on the left, lunges on the right. Upright rows on the left, deadlifts on the right. Mind you, this MMA dummy isn’t ideal for this kind of exercise, with its weight not evenly distributed and all. I used it for my workout, anyway. 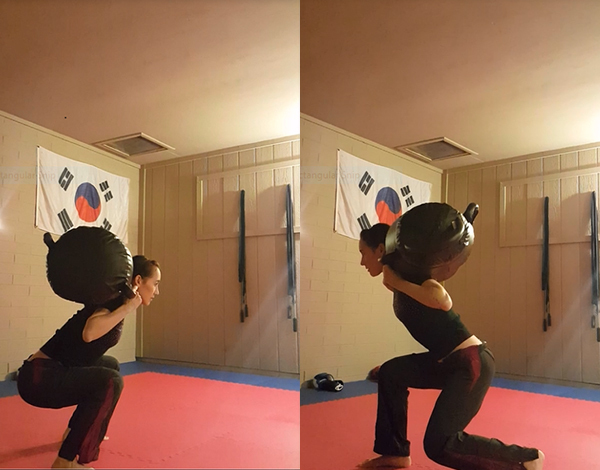 Also, the deadlifts were basically a joke because the bag is so bulky that my short self didn’t have far to go between standing and the floor. Yeah… I’ll use dumbbells for that next time. 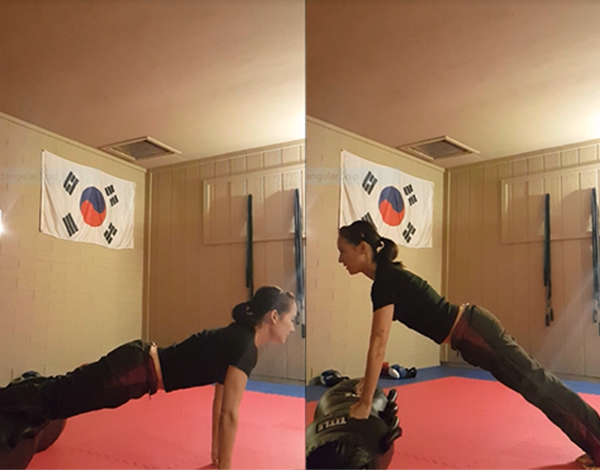 Decline push-ups on the left, incline push-ups on the right. 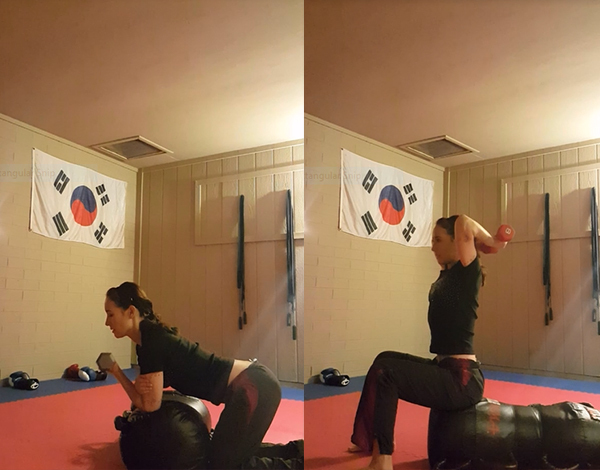 Outside of Body Combat, where I do push-ups on my knees to keep up with the pace, I do push-ups with straight legs and my head up, military-style… and I do them very slowly, lowering myself all the way down to touch the floor (or the bag), mindfully working my breathing into the exercise. Using the MMA dummy as a bench for dumbbell chest presses. The MMA dummy does function wonderfully as a bench. I used 20 lb dumbbells. We’re going to Play It Again Sports to get more in different weights. We want 15 lbs (especially me, for biceps), and we want some heavier ones. The 20 lbs are the heaviest we have at the moment. Bicep curls on the left, tricep skullcrushers on the right (not really skullcrushers if you’re not lying down, but for lack of a better term…). Lacking 15 lb dumbbells, I used the 10 lbs for the curls, and an 8 lb dumbbell in each hand for the skullcrushers. That’s a comfortable weight for me to keep good form doing that particular exercise. If I continue this routine, it shouldn’t be long before I can move those up to 10. First garage gym workout in two weeks, DONE. Also, it’s getting hot in here, and it’s only February. Let’s just take a second to think about the fast-approaching issue of heat. It was about 88 degrees F outside when I did this workout. By the end of the workout, I was uncomfortably hot. It is too early in the year for this. I was hoping to be able to use the garage gym at least through March without feeling the heat, but alas, today is the first day of March, and my mind is already shifting to heat-strategizing mode with that garage. Measures will be taken. The next day, yesterday, I started to feel everything. I’d done some serious weight-training for the first time in years, and my body was like, WHAT IS THIS. My abs are sore, though I didn’t do abs. 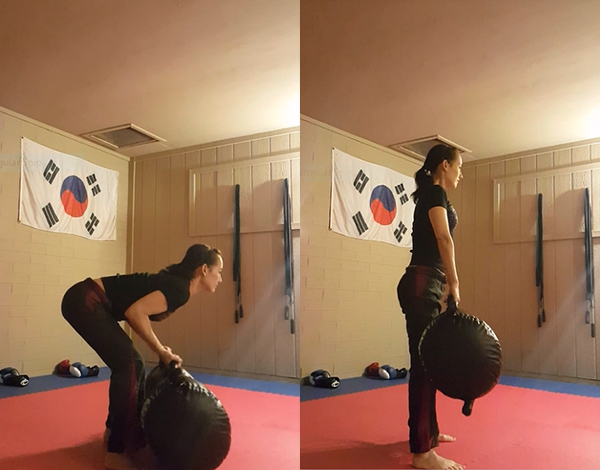 Evidently that 50 lb MMA dummy on my back forced me to engage my core as I did the squats and lunges, so that was good! My triceps, forearms, pecs, and quads are sore. My biceps, back, hamstrings, and glutes are not sore, because I didn’t hit them hard enough. My shoulders and calves aren’t sore, either, because I didn’t work them. Next time, then! I remember how I used to love that post-workout soreness when I was lifting weights regularly. I still love it. And Body Combat felt really good last night! It loosened everything up. You can put a separate window unit a/c in the garage together with a big fan. Working out when its too hot really does not do you much good. Alas, we don’t have a window in the garage… but we have a back door, and we can raise the garage door a little, too, to get some ventilation in there. ~Someone suggested that we get a fan of the sort that’s made for drying out carpets in rooms that have been flooded. He said that the fan is industrial-strength, and it pushes air along the floor, which will be more effective than a standard room fan. We’re going to try getting a couple of those. There are some that don’t make a lot of noise (but I wouldn’t mind a little noise if it means we can use the garage during the summer). =) Thank you for your comment and suggestion, Bob!